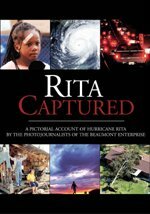 Professional photojournalist Mark M. Hancock discusses photojournalism and the eccentricities associated with gathering images for daily newspapers and magazines. 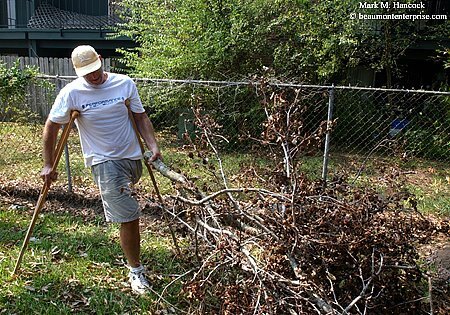 Bobby German clears brush behind his wife's dental office in Beaumont on Friday, Sept. 30. German lost his leg to cancer when he was 15. Dave Marshall of Victoria sharpens chainsaws from the bed of his truck on Dowlen Road in Beaumont on Friday, Sept. 30. 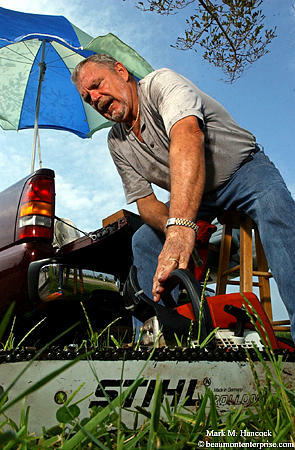 Dowlen West homeowner Mike Flash cleans the neighborhood's streets with his personal tractor in Beaumont on Friday, Sept. 30. 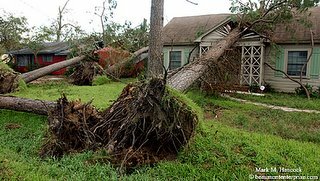 The city allowed residents to come into the city to check and secure their property from 7 a.m. to 7 p.m. The city requested all non-emergency residents leave the city by curfew. 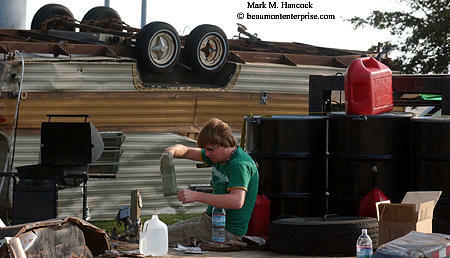 Danny Jackson (left) and Ralph Adger (right), both solid waste specialists with the City of Beaumont, help dump the rotting trash of Carla Tucker (center) of Beaumont at Central Park in Beaumont on Friday, Sept. 30. 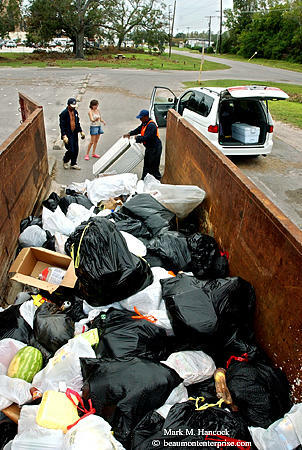 The city has requested residents dispose of food-based trash at designated locations while city employees continue to clear roads. (Above) Modica Bros. tire tech Jason Price mounts a tire on a car at a store in Beaumont on Friday, Sept. 30. Due to the massive amount of debris throughout the city, the company offered to fix flats for free. (Left) Modica Bros. warehouse manager Tony Patillo repairs a flat at a store in Beaumont. 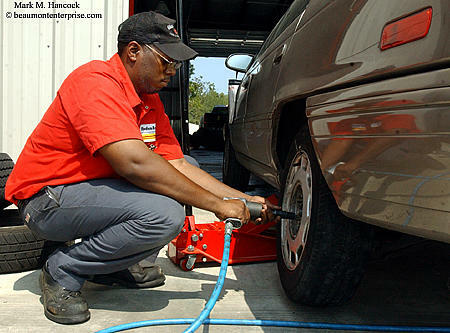 All available employees participated in repairing tires. 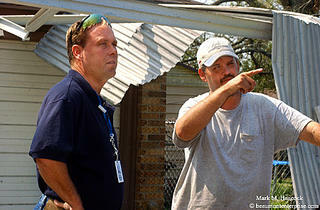 FEMA representative Tandy Boroughs, a Mesquite fire fighter, (left) listens to Randy Byars in Beaumont on Friday, September 30. FEMA representatives are going door-to-door to answer questions and notify the Beaumont Fire Department about houses with possible victims. Hurricane Rita tore through the Southeast Texas on Saturday, September 24, 2005. 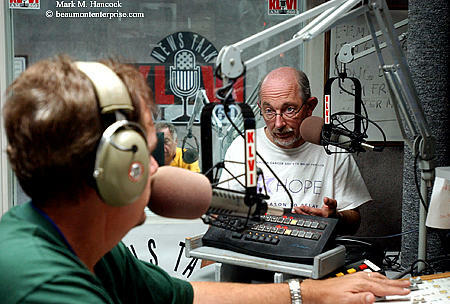 (Above) KLVI program director Jim Love (right) relays a report to Mix 104.5 program director Don Rivers (left) while producer Roger Dimmick (center) works in another room at KLVI radio in Beaumont on Friday, Sept. 30. 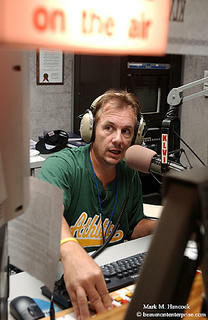 (Right) Mix 104.5 program director Don Rivers remains on the air in Beaumont. The five local Clear Channel Communication Inc radio stations have aired continuous team coverage since Hurricane Rita tore through the Southeast Texas. 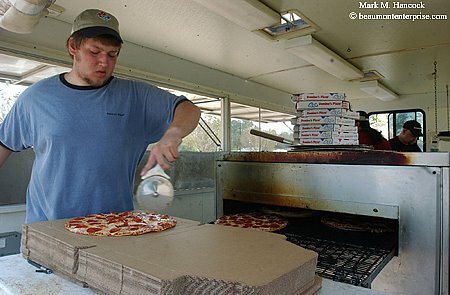 Eduardo Cuellar, Jr. (left) and Domino's district manager Danny Sciandra (right) prepare pizzas in the parking lot of Home Depot in Beaumont on Thursday Sept. 29, 2005. The portable unit started selling pizzas to the public and providing them free-of-charge to law enforcement and military personnel on Wednesday, Sept. 28. Previously, they were providing free pizzas to emergency and law enforcement officers at Christus St. Elizabeth hospital. 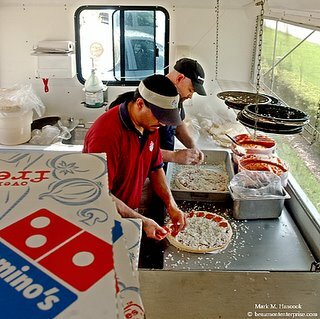 Aaron Stroud with the Beaumont Domino's Pizza cuts pizzas at a portable unit in the parking lot of Home Depot in Beaumont. 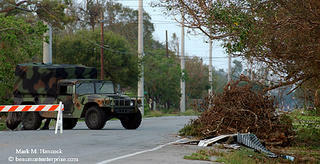 Areas of Port Arthur remain completely sealed to all but emergency workers in Port Arthur on Thursday Sept. 29, 2005. 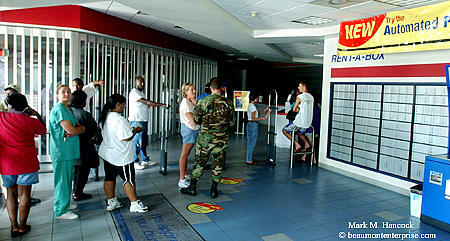 Beaumont residents wait in the dark lobby of the U.S. Post Office on Dowlen Road in Beaumont on Thursday Sept. 29, 2005. Residents who need their mail must go to the post office to retrieve it. A motel is severely damaged off Interstate 10 near Vinton, La. on Thursday Sept. 29, 2005. 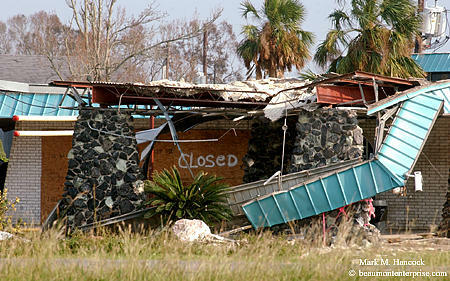 For additional coverage, please see Hurricane Rita's toll on SW Louisiana or Mark's Hurricane Rita visual timeline. 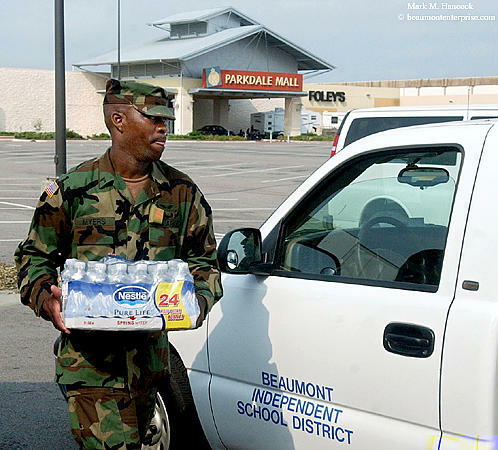 Members of Task Force Bowie provide food, water and ice to Beaumont residents at Parkdale Mall in Beaumont on Thursday Sept. 29, 2005. The task force was assembled with members from San Antonio, Grand Prairie and Terrell. Although many stores had made huge leaps to open and provide residents with needed supplies days earlier, it was the first day FEMA had arrived to feed people at Parkdale Mall in Beaumont. Cpl. David Myers of Grand Prairie puts water into a Beaumont ISD truck at Parkdale Mall in Beaumont. Farmers Insurance litigation specialist Brent Caffee (left) and special claims representative Greg Ferris (right) prepare food bags for anyone who needs them at a Farmers Catastrophe Claims Center at Parkdale Mall in Beaumont. 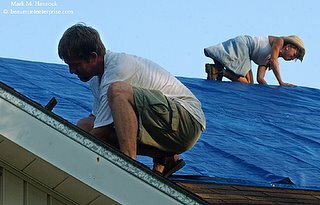 The team also presents policy holders with checklists before calling the company to file insurance claims. The team began operations in Beaumont on September 26. 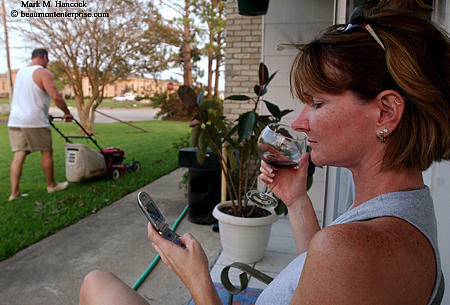 (Above) Doneane Beckcom of Port Neches (right) calls a radio station and drinks wine while her boyfriend Randy Reese (left) mows his lawn in Port Arthur on Thursday Sept. 29, 2005. (Left) Randy Reese mows his lawn in Port Arthur. 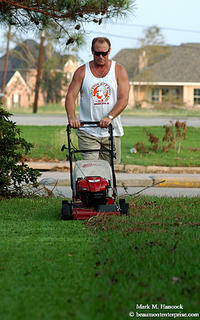 He said he wanted to return to normality and plans to make a sign touting the best-kept lawn following Hurricane Rita. 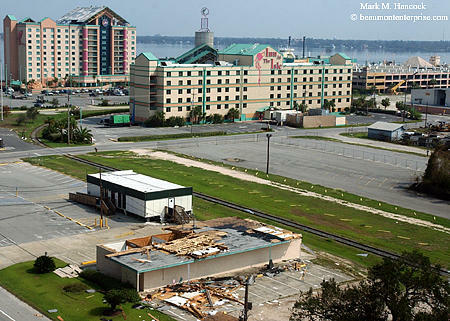 Lake Charles was on the "bad side" (northeastern quadrant) of Hurricane Rita. As such, it was assaulted by both hurricane force winds and a storm surge of up to 15 feet above normal. 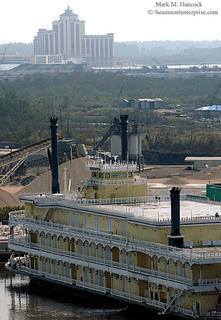 (Left) Casino boats at the Isle of Capri casino (bottom) were securely moored in Lake Charles, La. on Thursday Sept. 29, 2005. 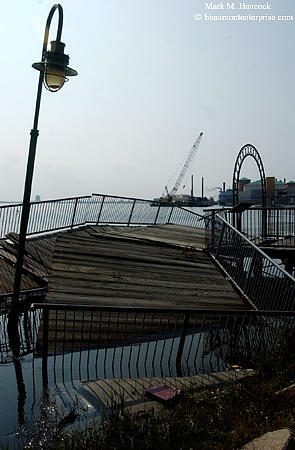 The Leberge du lac casino (top) has reportedly suffered more damage as most of the city remains closed to all but emergency workers. 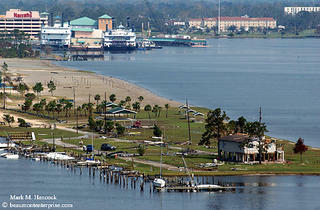 The Isle of Capri casino in Lake Charles, La. remains damaged. It is likely to be operational soon. Wind and tree damage in Lake Charles did not appear as severe as in Texas' Orange and Jefferson counties. 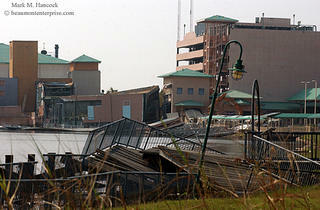 Harrah's casino has severe damage to walkways, however the casino boats were securely moored near the hotel. 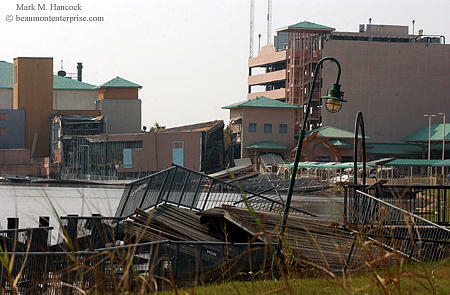 Harrah's casino (top) and a nearby marina (bottom) in Lake Charles remain damaged, however the casino boats were securely moored beside the hotel and are likely to be operational as soon as walkways are replaced. 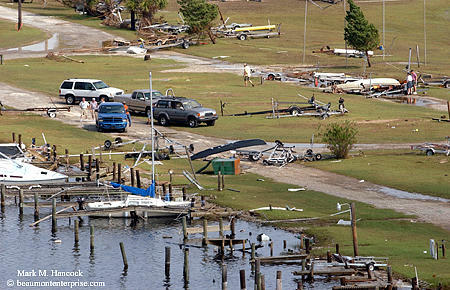 People inspect serious damage at a marina on Lake Charles. Most remaining small boats were washed away by the storm surge during the Hurricane Rita. (Left) The shoreline of Lake Charles, La. 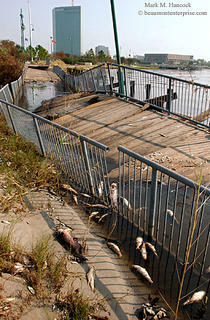 is covered with rotting fish and boardwalk debris while some downtown buildings maintained much of their integrity. 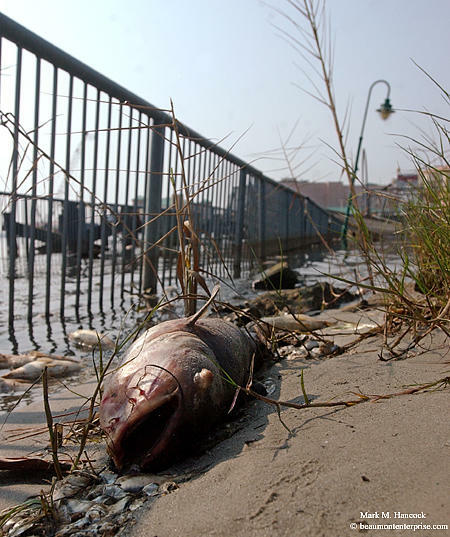 (Right) Many large fish remain rotting along the shores of Lake Charles. (Left) The boardwalk along Lake Charles remains damaged as reconstruction begins on Harrah's casino across a cove in Lake Charles, La. 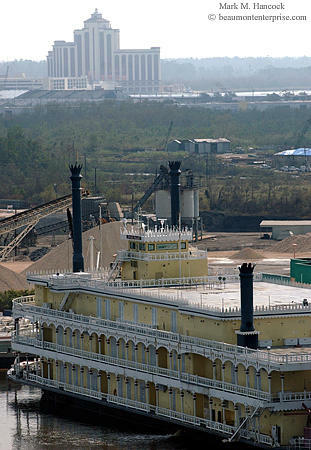 A petrochemical plant in Lake Charles, La. doesn't appear to have serious damage. 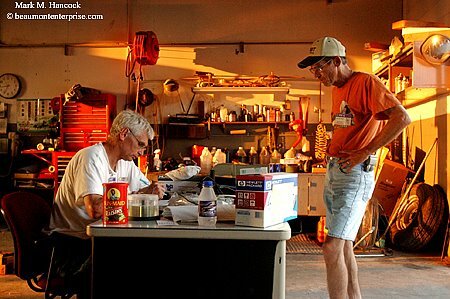 Chris Grantham with A-1 Tree Service of Memphis, Tenn. eats a beef enchilada MRE at the Boomtown USA campgrounds in Vidor on Thursday Sept. 29, 2005. 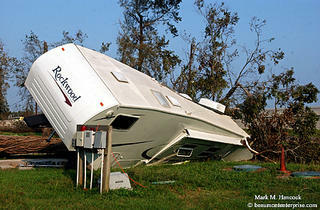 A camper trailer remains crushed under a tree at the Boomtown USA campgrounds in Vidor. The Boomtown USA Waterpark and campgrounds in Vidor remains largely destroyed. 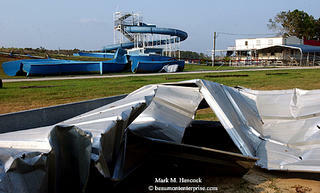 Regular readers may remember this image of the waterpark from May. 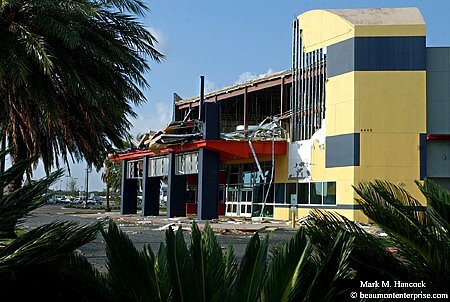 Hollywood Star movie theater at Parkdale Mall in Beaumont remains destroyed on Wednesday, September 28. 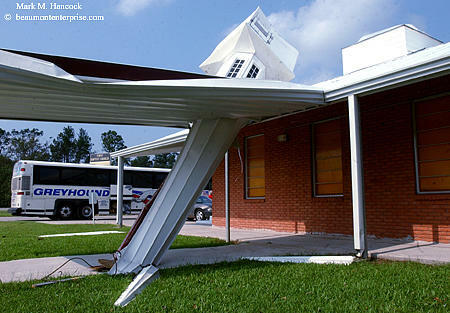 It's likely The building was hit by a tornado inside the hurricane. Houses remain crushed under trees in Beaumont. (Left) Antonio Bonapart with Craig Lightfoot Tree Service of Dalto, Ga. removes trees from an apartment complex in Beaumont. 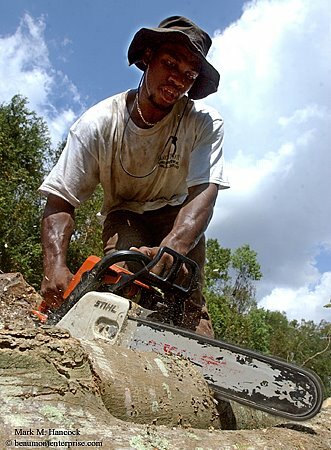 Bonapart also cleared trees after Hurricane Katrina hit the central Gulf Coast last month. 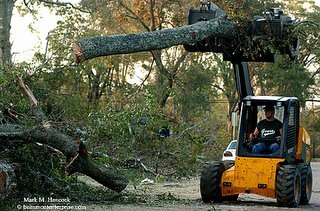 (Below) Jimmy Hoover with Sidonian Tree Service of Texarkana removes trees from the property of Michael Jenkins in Beaumont. 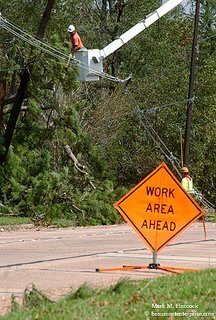 (Right) A crew cuts trees from power lines along Folsom Road in Beaumont on Wednesday, Sept. 28, 2005. 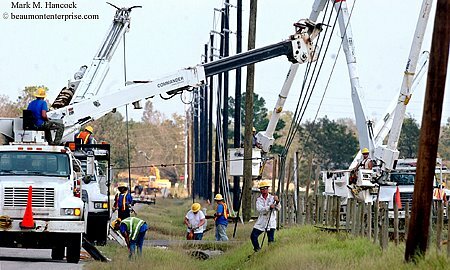 (Below) Workers with Pike Electric Inc work along Dishman Road in Beaumont. Entergy officials believe Beaumont's downtown and oil refineries may get electricity soon. 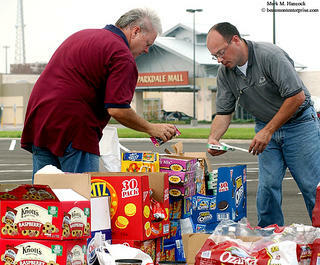 (Above) Beaumont residents wait for food from The Salvation Army in Beaumont on Wednesday, Sept. 28, 2005. The Salvation Army offered food, water and ice to anyone who requested help. Food, water, ice and fuel have been difficult to locate since Hurricane Rita hit. 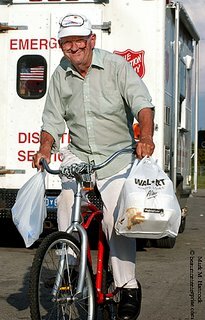 (Right) Kenneth Taylor of Beaumont rides away happy with the food and water he got from The Salvation Army emergency disaster service facility in Beaumont. 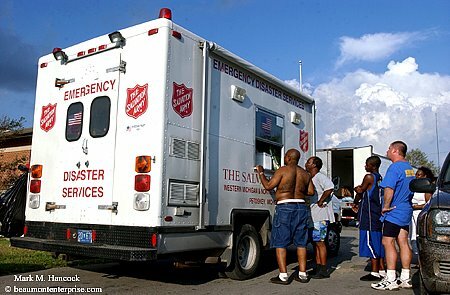 Although the hurricane damaged and closed the shelter, The Salvation Army continues to feed and provide other needs to area residents from an emergency response vehicle at the location. 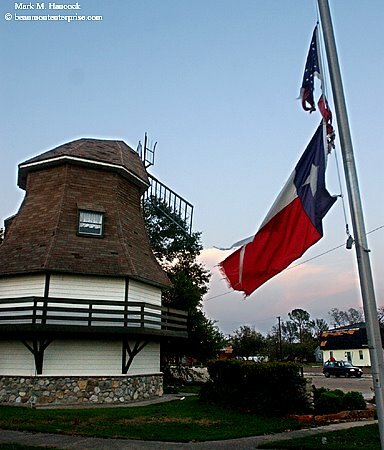 The Windmolen at Tex Ritter Park remains damaged on Tuesday in Nederland Sept. 27, 2005. The city was settled by Dutch immigrants in 1897. 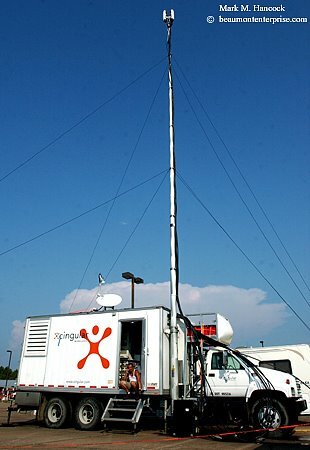 A Cingular Wireless employee talks on a cellular phone at a temporary cellular tower in Orange on Tuesday, Sept. 27. 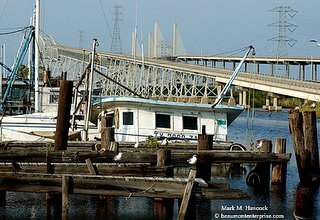 Retired shrimp boats are sunk at Esther's Seafood & Oyster Bar Inc by the Rainbow (left) and Veterans Memorial (right) bridges in Jefferson County on Tuesday September 27, 2005. Matt Cole (left) nails down a tarp on his home in Port Neches on Tuesday Sept. 27, 2005. 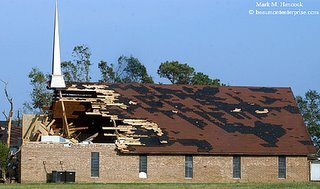 The Groves Community Seventh-Day Adventist Church remains seriously damaged in Groves. However, it has one of the few remaining steeples in the area. PNISD emergency management representatives Lane A. Emmett (left) and Leonard Lapoint (right) work on plans to help the community on the Port Neches-Groves High School campus in Port Neches on Tuesday, Sept. 27, 2005. 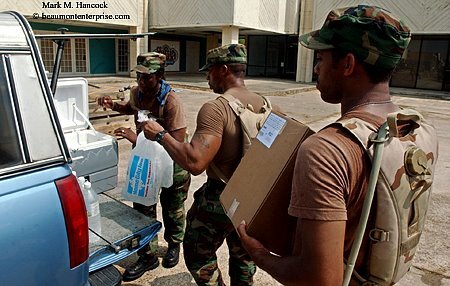 The three-man response team has preserved and delivered food from district schools to emergency workers and the community. Emmett, who is also the district's director of transportation and safety, would like the district's school busses returned. The busses were filled with special needs residents, driven directly onto military airplanes, and flown to unknown destinations. He said they are easily identified with the district's name emblazoned on the side. R. A. Ogden, 77, patrols his neighborhood for looters in Port Neches. 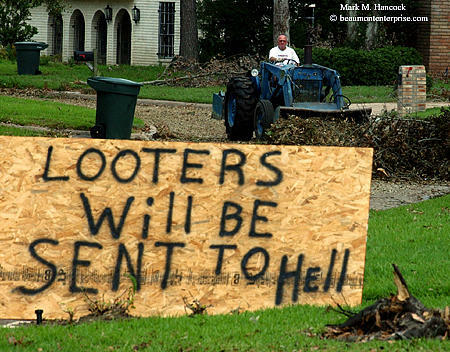 He said he rode out Hurricane Rita for the excitement. Soldiers with B Company of the 449th Aviation Support Battalion supply Orange County residents with food, water and ice at a federal disaster distribution site in Orange on Tuesday, Sept. 27. 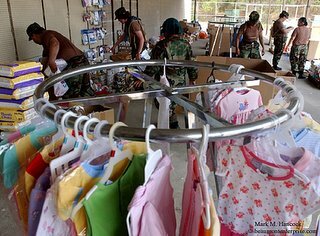 Soldiers with B Company of the 449th Aviation Support Battalion supply Orange County residents with baby food, diapers, feminine hygiene and other necessities at a federal disaster distribution site in Orange. 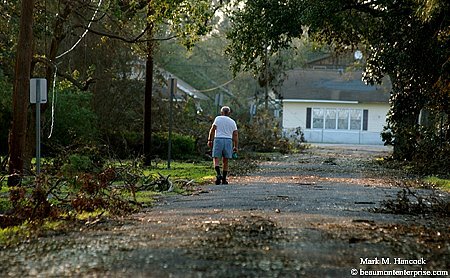 A Greyhound bus prepares to evacuate Hurricane Rita survivors from the First Baptist Church in Mauriceville on Tuesday, Sept. 27. 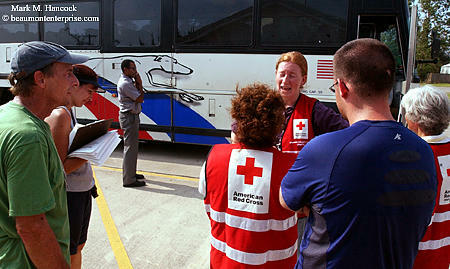 Erin Marie Panttaja (right) and other American Red Cross workers express their disappointment as a Greyhound bus prepares to evacuate Hurricane Rita survivors from the First Baptist Church in Mauriceville. 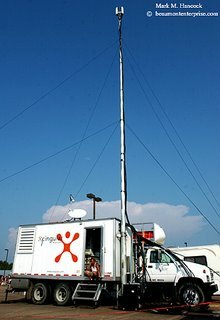 The Red Cross workers had used the location as an emergency shelter, but were forced to evacuate survivors and downgrade the facility to a feeding point after no relief arrived after several days. American Red Cross volunteer Charlene Simmons helps prepare food for a food distribution point at the First Baptist Church in Mauriceville. 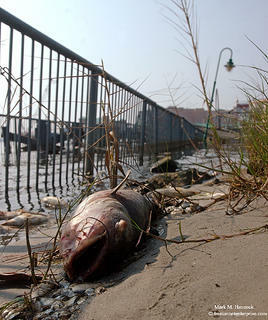 Type "photojournalism" in most search engines to return here. * Hold Ctrl and scroll mouse to change font size. * Click on pictures to see larger photos. The 2nd printing has also SOLD OUT. Thanks for your support and helping The United Way. All content on this site © Mark M. Hancock and/or the designated publications.